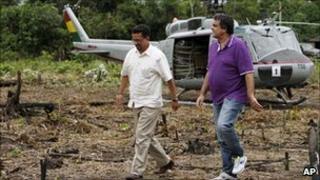 Brazil has signed an agreement with Bolivia to tackle cocaine production and trafficking in the country. The deal aims to fill the void left when Bolivia expelled the US Drug Enforcement Administration in 2008 for alleged political interference. Brazil will help train and equip Bolivian security forces, and deploy drone aircraft to patrol the border. Bolivia is the world's third largest producer of cocaine, and more than half its production goes to Brazil. The Bolivia-Brazil Action Plan was signed by Brazilian Justice Minister Jose Eduardo Cardozo on a visit to Bolivia. He said drug trafficking was a "transnational crime" that could only be confronted by international cooperation, involving countries both inside and outside the region. On Tuesday Mr Cardozo visited a rural area in central Bolivia to see security forces eradicating fields of coca - the raw material for cocaine. Brazil is a major consumer of cocaine, and drug trafficking gangs are a serious security threat in many Brazilian cities. Bolivian and Brazilian officials said they might to extend the agreement to include Peru - after Colombia the world's second biggest cocaine producer - which also shares a long land border with Brazil. The deal comes weeks after US and UN reports said Bolivia was not doing enough to tackle cocaine production and trafficking. Bolivian President Evo Morales rejected those claims, accusing the US of falsely trying to link his government to drug trafficking. Criticism of Bolivia's anti-drug efforts has been mounting since February, when a former commander of the national anti-narcotics police, Gen Rene Sanabria, was arrested in Panama on charges of drug trafficking. Mr Morales is himself a former coca grower, and defends the use of the leaf for medicinal and ritual purposes while insisting his government is doing all it can to stop cocaine production.